Former MP Lulume Bayiga is currently on remand. File photo. The Democratic Party, Uganda’s oldest opposition party, has lined up its lawyers to sue individual policemen who were involved in assaulting its former secretary general Dr. Lulume Bayiga. Bayiga, a former Buikwe South legislator, was arrested over the weekend and remanded to Luzira prison over assault, malicious damage and conspiracy to commit felony. He was found with others doctors who had camped at Ngogwe sub-county, treating elderly people, during the medical camp organized By Rotary Club of Mukono. 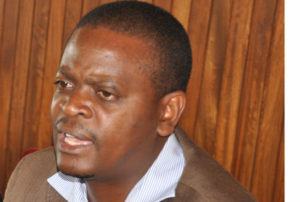 Kenneth Paul Kakande, the party’s spokesperson, said Bayiga never committed any crime. “As a trained doctor and concerned citizen, he was concerned about the poor health of his people. He joined his colleagues to treat them. But they were shocked to see Police men, assaulting him. As DP, we have deployed our lawyers to file the case against individual policemen who were involved,” Kakande stated. According to two eyewitnesses, Bayiga was picked by Police men, both in uniform and plain clothes. The local residents tried to block his arrest but were over powered. Following the arrest, Bayiga was given treatment at the Police clinic, after he complained of severe pain inflicted on him during the arrest. Police, however, denied assaulting Bayiga, adding that he was on the wanted listed. Sezibwa Region Police spokesperson Hellen Butoto said Bayiga has been hiding, accusing him of holding unlawful assembly and assaulting a Police officer. But DP president Nobert Mao said Bayiga was tortured because he is against the lifting of Presidential age limit. “He is the only voice in Buikwe , who is fighting against life Presidency. But this will not block him from continuing with his struggle,” Mao said. Bayiga served the constituency for two terms and in last year’s general elections, he was defeated by NRM’s David Mutebi in a highly contested Parliamentary race.